Sacrifice is meaningless without remembrance!! Once you have worn a military uniform in this Country, there are certain things that just don’t seem the same as they do to lots of other people. Take memorial day for instance. This morning the radio reminded everyone that this is official start of summer. Yea, that’s cool. But that was not the purpose of setting this day aside. Sometimes I wonder if anyone really cares about men and women who dare to raise their right hand, and take an oath to protect this country. Or the men and women who hold the offices that control the flow of our military. In this world where some many young people are taking fro granted the freedoms that they enjoy with each passing moment of each day. The ability to walk down the street safely. Over the past few years our country has been under a siege of sorts. Not form an enemy from without, but one from within. The structure of our country is being attacked, and dismantled piece by piece. Our country was founded on the principles of the King James Bible. So well is it part of who we are that the US Marines still guide their lives by it. Second the the Marine Corp manual. Yet so many want to do away with the idea of a God that loves us, and still cares for us. Today as I attended the memorial celebrations at Camp Nelson Cemetery, in Nicholasville, KY. I noticed something really interesting. As you know no matter what people always stand for the Star Spangled Banner. No one ever really needs to say “let us stand”. By the time the music plays everyone stands up. Well today a singer was called up to sing “God Bless America” and what a job she did. But in keeping in complete character the actor playing president Lincoln Stood up alone during the first two lines of that song. As folks sitting across from him noticed his posture. Everyone stood. That is what a president is suppose to do, suppose to be like, and most of all live it. Presidents like Abe Lincoln valued their beliefs in this country and the things that made us strong, and who we are. Our roots are stained with blood shed to protect the right the Say thank you to God, and receive his blessings over this land, we call home. So Mr. Jim Sayre, Who played Lincoln today. I salute you. For reviving the spirit of a President that valued his troops, his people, his country, flag. And a God that has kept us blessed! So I pray that as we stop to truly remember those who have served, fought, and died for the freedom we have, let’s Thank God for the blessing we still receive from him. I read a story of a young boy, whose parents have actually taught him very well about what it cost. And what he did to pay honor to those that had fallen, brought me to tears. He stood for them that could no longer stand. Go ahead click on that link, and watch how when God protects, things happen. Standing for them! 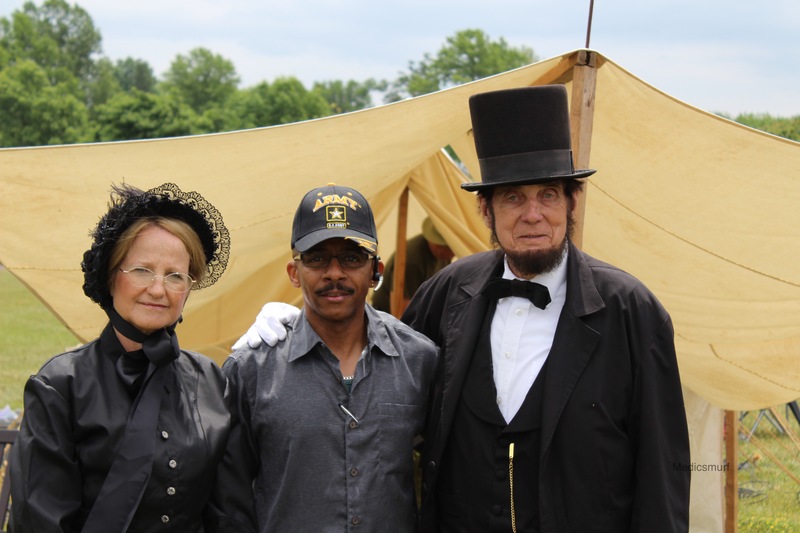 Posted by Medicsmurf on May 25, 2015 in General and tagged America, camp nelson, civil war reenactment, country, flag, God, God bless America, memorial day, president, president Lincoln, sacrifice. I am an ex- NY City Emergency Paramedic. Life brings us new challenges, adventures, and downfalls. I look to making them all a positive way to grow. From here we only go up.